Mancini, Lee Ann (author). Sharp, Dan (illustrator). What a Bragger: Sea Kids Series. Boca Raton, FL: GLM Publishing. 2015. Absolutely loving the first book in the Sea Kids series, Fast Freddy, I knew I had to read this one! While teaching a lesson gently, this book also incorporates faith, adorable characters, lots of color, and the most fantastic pictures. The hidden Jesus symbol on each page is an added bonus. (I even needed help finding one of the fish!) Combining an author with several Master degrees in Theology with an illustrator who designs for Disney and Warner Brothers, What a Bragger is perfect for children (and adults) of any age. Part of the proceeds of this book are even donated to Christian charities that minister to children…I may just love the Sea Kids as much as the author and her sisters do! 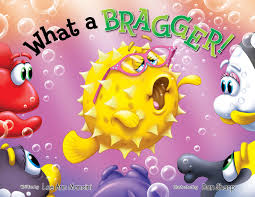 This entry was posted in Christian Youth Books and tagged Bragging, Christian, Christian Author, Christian Book Review, Christian Contemporary, Christian Fiction, Dan Sharp, Inspirational, Lee Ann Mancini, Sea Kids, What a Bragger by Savurbks. Bookmark the permalink. Now if this isn’t the cutest thing I’ve seen all week. 🙂 Looks like a fun and heartwarming story. It might be a part of “coming full circle” for me–maybe that and a tad of unexpected babysitting–but I’ve actually just begun keeping my eyes peeled for good children’s books. The story and pictures are so wonderful…with the added task of finding the Jesus symbol! I tend to read anything that catches my eye- even children’s books! 😀 I’m the same way! Nothing beats books with pictures in ’em. Honestly, I wish more adult novels included pictures–more than just the book cover. I have a copy of Paradise Lost with illustrations; sometimes I just go back to look at them and read the captions, and it takes me right back into the story! Anywho.